Panera Bread founder Ron Shaich. Panera Bread Co. founder Ron Shaich's slide-deck title for The Deal's annual corporate governance conference says it all about today's climate for public companies, where a big-name activist investor seems to always lurk. "Building Companies of Value in a Short-Term World." There have been 173 proxy fights globally so far this year, down from 202 for all of 2017, according to FactSet. But, that's still an impressive figure considering that more battles are likely still to come. A total of 18 fights were withdrawn, 44 were settled and activists won 19 that went the distance while management was victorious in 14, as of May end. Two contests split. This suggests that contests that go the distance aren't necessarily trending towards company victories, as they have in previous years, which isn't a shocker in this activist-fueled world. Since 2012, the number of activist campaigns has surged 18%, according to FactSet. "Our public markets have become increasingly shortsighted and, indeed, hostile to those companies like Panera competing on the basis of long-term transformation," Shaich said at Thursday's conference. "While hedge funds increasingly trade stocks based on an assessment of the next data point and ͞active money managers focus on short-term performance, as they are now ͞marked to market and incentivized on quarterly returns." Added Shaich, "The increasing use of high-frequency, algorithm-based trading strategies further magnifies the problem." Panera Bread found itself in the cross-hairs of activists twice: in 2007 with Shamrock Activist Value Fund LP and in 2015 with Luxor Capital, Fortune reported. The latter battle led Panera to issue $500 million in new debt to buy back shares to appease Luxor. But in the case of Shaich, he was the one getting the last laugh over the activist crowd. At age 27 and a only few years removed from Harvard Business School, in 1980 Shaich opened a cookie store in Boston called the Cookie Jar. Ever the people watcher, Shaich began ordering baguettes and croissants for his store from a nearby Au Bon Pain after observing that many folks weren't buying cookies before noon. Sensing an opportunity to sell more exotic sandwiches than the standard ones on whole wheat or rye, Shaich approached venture capitalist Louis Kane, who was running Au Bon Pain at the time, about joining the bakery chain. The two formed a partnership in 1981. By 1993, Au Bon Pain, which went public in 1991, had spread across the U.S., and purchased St. Louis Bread, a regional restaurant chain known for its fresh ingredients and inviting environment. Shaich wanted the company to shift its attention toward St. Louis Bread instead of Au Bon Pain and after he prevailed in a board fight, Au Bon Pain was sold to a private-equity firm in 1999. Shaich then took the helm at St. Louis Bread and changed its name to Panera, which is Latin for "bread basket" or "bread bowl," in order to appeal to a wider audience. From there, Shaich led an aggressive roll-out of Panera Bread restaurants across the country that has driven its stock to return more than 3,900% under his leadership. In 2010, Shaich chose to step aside as CEO but retain the role of executive chairman so he could pursue philanthropic interests such as driving awareness of hunger in America. 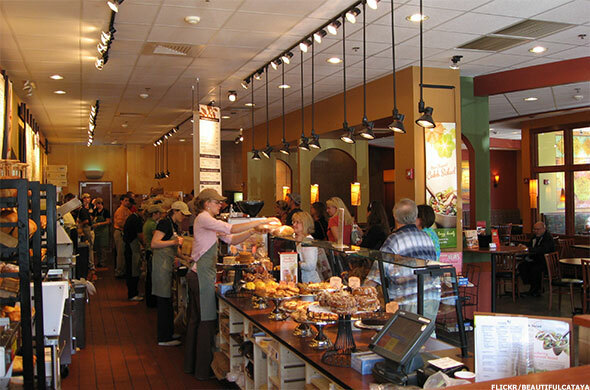 At the request of long-time friend and CEO Bill Moreton, however, Shaich returned to Panera as chairman and CEO in 2013. He went onto lead a major menu shift to healthier ingredients (that others like McDonald's ( MCD - Get Report) are still only dabbling in today) and a digital ordering roll-out. In April 2017, Shaich signed off on a sale of Panera Bread to JAB Holdings for $7.5 billion. He retains the role of chairman and shares his advice with upstart companies. He also has a reminder to public company CEOs: stop being among the fearful, and stay bold. "The reality is this ... fear hangs over the decision-making process in most public companies as boards and management seek to avoid becoming an activist's target," Shaich says. "In reaction, CEOs focus more than ever on short-term fixes which, in turn, reduce a company's options to drive real value creation by being a better competitive alternative through continuous and long-term transformation." --Ron Orol contributed to this story.